Japan is now confronting political challenges that are as serious as any it has had to face since World War II’s end but the dearth of competent leadership means that the opportunites for change are not being seized. OSAKA – Japan is now confronting challenges at home and abroad that are as serious as any it has had to face since World War II’s end. Yet the Japanese public is displaying remarkable apathy. The country’s two major political parties, the governing Democratic Party of Japan (DPJ) and the Liberal Democratic Party (LDP) recently chose their leaders, yet ordinary Japanese responded with a collective shrug. But Japan’s political system is unlikely to remain a matter of popular indifference for much longer. The DPJ first came to power in September 2009, with an ambitious program promising comprehensive administrative reform, no tax increases, and a freer hand in Japan’s alliance with the United States. But, owing to the party’s inexperience and incompetence at every level of policymaking – shortcomings that were compounded by the unprecedented devastation of the great earthquake of March 11, 2011 – the first two DPJ governments, under Yukio Hatoyama and Naoto Kan, ended with those pledges in tatters. Consequently, several dozen legislators, led by the perpetual rebel Ichiro Ozawa, defected from the DPJ, forming a new rump opposition party. The DPJ has now reelected incumbent Prime Minister Yoshihiko Noda as its president, despite his very low public-approval rating. With a thin majority in the lower house and a narrow plurality in the upper house (which has adopted a censure resolution against Noda), the DPJ on its own is unable to pass fiscal and other legislation essential to running a government. As a result, the prime minister is barely muddling through – and only by agreeing with the major opposition parties to dissolve the lower house. Though he has not specified exactly when he will do so, the endgame for the DPJ government has begun. Yet the rival LDP, which had governed almost uninterruptedly for several decades until 2009, has proven itself to be an ineffective opposition party. Unable to overcome popular distrust, owing to its longstanding symbiosis with the bureaucrats and subservience to the US, the LDP has been incapable of holding the DPJ accountable in the legislature. Instead, the LDP, having failed to reinvigorate itself and attract allies, has occasionally taken a buck-passing approach, such as permitting the DPJ to pass an unpopular but inevitable and necessary increase in the consumption tax. In an effort to enhance popular support for the party, the LDP presidential campaign took advantage of a heightened sense of crisis centered on Japan’s territorial disputes with Russia, South Korea, and, most recently and alarmingly, China. The party chose as its leader former Prime Minister Shinzo Abe, who is known as the hardest of hardliners on nationalist matters, but who is also widely perceived as having acted irresponsibly when he abruptly gave up his premiership in 2007, after only one year in office, due to health problems. His comeback has given the country a rather odd feeling of déjà vu. So, the Japanese public is now searching for a party that can take on the tasks of reforming the country, reviving the economy, and enhancing national security. Neither the DPJ nor the LDP appears dependable in any of these areas. 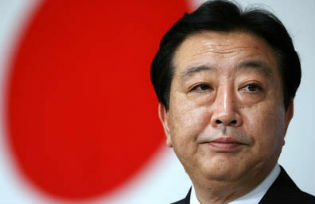 As a result, the public is paying increasing attention to the newly created Japan Restoration Party (JRP) and its populist leader, Osaka City Mayor Toru Hashimoto, a former governor of Osaka prefecture and the son of a minor Yakuza (mafioso). The JRP aspires to be a ruling party, or at least a kingmaker in Japanese politics, but it has an almost exclusively domestic agenda and suffers from a dearth of talent below Hashimoto. Without a comprehensive agenda and expertise in foreign and security policy, the party will most likely stumble badly should it come to power. It is almost certain that the next general election will not produce a parliamentary majority for a single party. Given the parties’ ideological, organizational, and policy disarray, Japan will enter a period of profound uncertainty, ultimately leading to an unprecedented political shakeup. This prospect may seem surprising, given that Japan has already lost two decades since its economy’s bubble burst in the early 1990’s. But, after a short-lived non-LDP government, successive coalition governments until 2009 had the LDP at their core. Japan’s hidebound postwar regime has been insulated, externally and internally, by relatively unchanging geostrategic and economic conditions. The country remains the world’s largest creditor, and has slowly but steadily eliminated enormous non-performing loans in its banking sector. Moreover, the Cold War never ended in East Asia, requiring the preservation of a US-led security system centered on the US-Japan alliance – an alliance that appears to presuppose a pliant Japanese political system. In fact, the system’s resilience in absorbing huge disruptions – the 2008 financial crisis and the 2011 earthquake – is one key reason for its survival. Thus, Japan remains broadly credible, at least relative to the US and the European Union. The yen’s appreciation reflects markets’ assessment that Japan’s economic position is stronger than that of the US and the EU, which are burdened with serious structural problems of their own. Indeed, with a huge capital surplus and very low interest rates in a time of creeping deflation, Japan now has a golden opportunity to invest in public infrastructure, education, defense, and overseas projects – a burst comparable to the British Empire in the late nineteenth century. But Japan is unable to seize these opportunities, because its political system is incapable of producing competent leadership. Given rising tensions in Asia, the question is how long this can last. China’s rise and America’s relative decline present not only a danger for Japan, but also an opportunity – and perhaps the needed momentum boost – for real reform. Masahiro Matsumura is Professor of International Politics at St. Andrew’s University (Momoyama Gakuin Daigaku) in Osaka.